Ever encountered the phone date is inaccurate problem in WhatsApp. This errors is shown when WhatsApp deems your phone’s date as wrong. This may well be a reality or it may as well be a confusion. Let’s see how to solve this problem. WhatsApp has really captivated our lives. It has changed the way we communicate with our friends, relatives and colleagues. WhatsApp has become so important part of the lives of millions of people that any problem in the functioning of WhatsApp can make them feel anxious. One of such problems comes when WhatsApp says “Your phone date is inaccurate! Adjust your clock and try again.” When this error comes, WhatsApp does not start and you just can not use it. Today we will talk about how you can solve your phone date is inaccurate error. 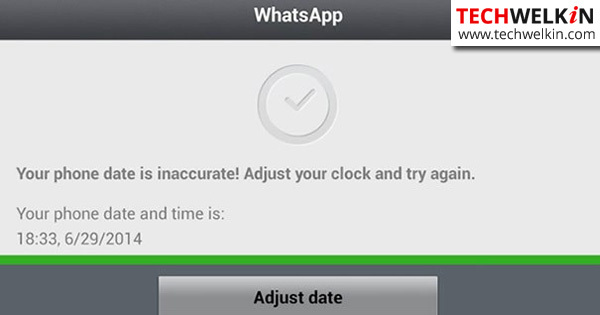 Here is the screen that you get when WhatsApp detects an inaccuracy in your phone’s date and time. Most of the time, however, this error is just because of a confusing date difference. There becomes a clash between the phone date and what WhatsApp sees as date. WhatsApp screen showing inaccurate date error. Solution 1: Do what it says! 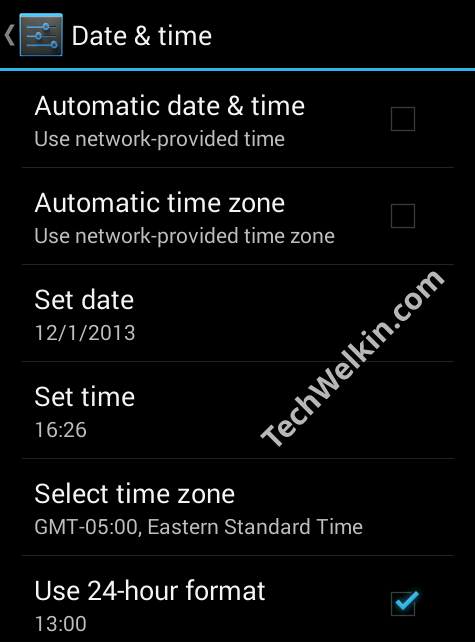 Date Time Settings Screen of Android Mobile Phone. On this screen, check if the date and time are correct. If these value are incorrect, set them right and then again open WhatsApp. If your phone’s date and time were really wrong, then the error should be gone by now and you should be able to use WhatsApp again. However, if WhatsApp still shows the inaccurate date error, then you should try the next solution. It is possible that your WhatsApp version is out of date. Older versions of WhatsApp are known to cause the “Your phone date is inaccurate! Adjust your clock and try again.” error. Therefore, you should update WhatsApp to its latest available version. Tap on the Update button. This action will download the latest version of WhatsApp and install it. 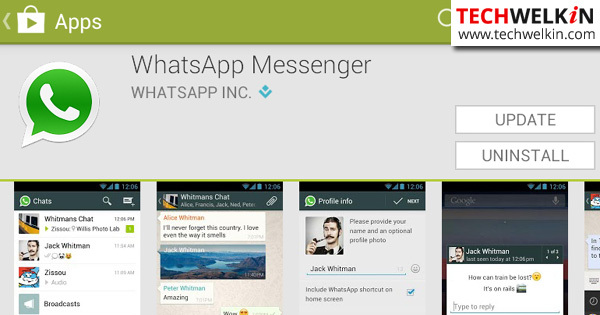 Update WhatsApp in Google Play Store. This update should solve the problem. But if the problem persists, it’s time to try the next step. If updating does not work, you should uninstall WhatsApp from your mobile phone and install its latest version afresh. Follow the steps given in the previous method to locate WhatsApp in Google Play Store. But this time, instead of updating it, go for complete uninstall. Do not worry, you will not lose any messages while uninstalling WhatsApp. You will get all the contacts, chats, status messages, images and videos back when you will install WhatsApp again. After reinstalling, open WhatsApp and see if it is still throwing the “Your phone date is inaccurate! Adjust your clock and try again.” error. Most probably, the error should be gone and you should be able to use WhatsApp again. There could be some exceptional cases where the error would still persist. For example, after reinstalling or update, WhatsApp may ask you to verify your phone number again. WhatsApp sends you an SMS containing a verification code for this purpose. But sometimes this SMS fails to arrive and the verification by SMS does not work. In such a case, WhatsApp will offer you verification by voice. You will receive a call from WhatsApp which will tell you the verification code. You need to listen to and enter the code in order to complete the verification process. We hope that this article on how to solve the WhatsApp inaccurate phone date problem helped you. If you have any questions related to this subject, please post them in the comments section given below. We will try to assist you. Thank you for using TechWelkin! Good one. Thanks. Issue resolved. I am getting date message, when it is touched for downloading a display box appears reading “your phone date is inaccurate. Adjust the time & date in your clock and try again”. check for date settings which is fine. So I deleted, uninstalled WhatsApp, reinstalled it. But its still showing installing status when I try to install from Google Playstore. Please could you help me to solve the problem. bcos whatsapp out of version in blackberry and not permitting to after a particular date. As I use WhatsApp using WiFi, it is found that a lot of downloads are pending. I uninstalled WhatsApp from my android device. When I freshly try to install it, it shows download is pending. At this moment there is no WhatsApp App into my device. How to solve it, i,e how to get installed again ? Thanks !!! Brilliant i uptade my whatsapp and it works wowww ?????? Thanks… For the advice.. Let me try hope it will work as others said. THANK YOU!!!! Re-installing worked. Happy now! Thanks but no thanks, I followed all the steps you told me but WhatsApp still gives the same error. Also the old WhatsApp does not want to go away. If I try to delete the old one it keeps coming back on my screen. What can I do? Hello, I’ve tried all of above and problem still persists. Any other suggestions. I followed your instructions and uninstalled WhatsApp and went in to download the latest version but the displayed remarks -Cant install app: Insufficient storage available. I have more than what the app space required. Please help! I had been using WhatsApp in my iPhone4 since this App was launged years ago. However, my iPhone4 does not download WhatsApp msg now-a-days. Only the screen display (first few words) is seen when msg is received. When it is touched for downloading a display box appears reading “your phone date is inaccurate. Adjust the time & date in your clock and try again”. I deleted WhatsApp, reinstalled it, updated it (But when updated it asks for Versions at least ios 6 OR offers to download the compatible version). So I had been doing so many times on several occasions, but still the same display “your phone date is inaccurate ……….” appears. Is it possible to operate WhatsApp successfully in my iPhone4? Kindly advise with a solution if any. WhatsApp is now available again on my new mobile (same number) through this helpful advice. Thank you!